We are a local real estate buying company. We buy houses all around Gilbert, AZ because we have funds ready. Banks don’t like us because they can’t charge you any fees. And real estate agents don’t like us because we buy houses directly from homeowners. So agents can’t charge you commissions. We can close in about one week so you could pick up your check next week at the closing. Yes, that’s much faster than using real estate agents, many of our competitors like Opendoor, Offerpad and bankers. Find out more info about how we buy houses fast here. And we have money ready to buy more Gilbert houses. So financing won’t slow us down from helping you. 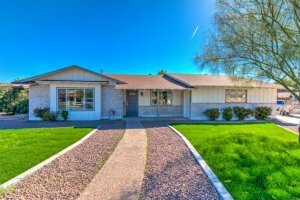 Want To Sell My House Fast In Gilbert, AZ? If your main objective is to sell now rather than wait months for a buyer to come along, then we can help. We do not use banks or mortgage companies. We just use our own funds. Bank approvals and paperwork slow down the house selling process. So we’ve simply taken that step out of the process. We buy houses in just days, not months like someone who uses traditional financing. We help people who are in tough situations, such as death of a family member, foreclosure, divorce, difficult rental property, unaffordable repairs, and many others. We can help people by buying their Gilbert property at a fair price and using all cash.